If you’re going to the PASA Conference this week, Dusty and I will be presenting on Friday at 8:45am. When I last saw you, it was winter. It seems like winter’s creeping in again, but we sure did have some nice spring-like weather in between. I enjoyed it, and, as these winter warm spurts always do, it renewed my faith that eventually real spring will arrive. And I sure am looking forward to that. For now, though, looks like we have a mild couple of days here coming up before real winter returns. So, might I suggest stocking up on some winter veggies to warm your soul as the weather turns cold? 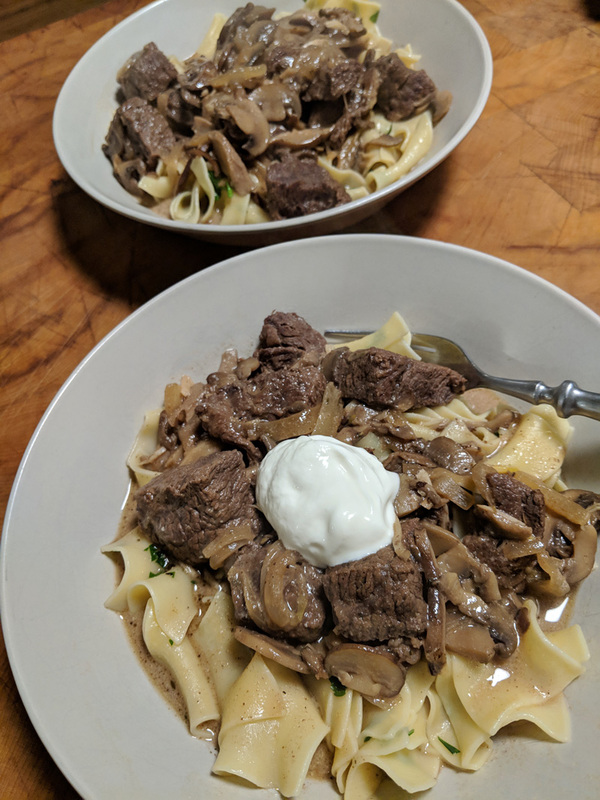 Mushrooms are plentiful this week, so Dusty made us a stroganoff, which is one of my favorite comfort foods. On the other end of the spectrum, I’ve also been dreaming about that Ginger Peach Chutney we’ve got, and thinking about doing some kind of baked salmon with it? Lighter than stroganoff, yes, but I think the warm flavors of the chutney would be a brace against a cold evening. Really, though, my brain is still swimming with getting ready for the Market week, and for our presentation on Friday morning. Dusty and I’ll be gone from Thursday afternoon through Saturday morning, and our wonderful crew will be around to take care of you. Marie’s even here from Philly!